There are miniature therapy horses at the Cincinnati Airport. 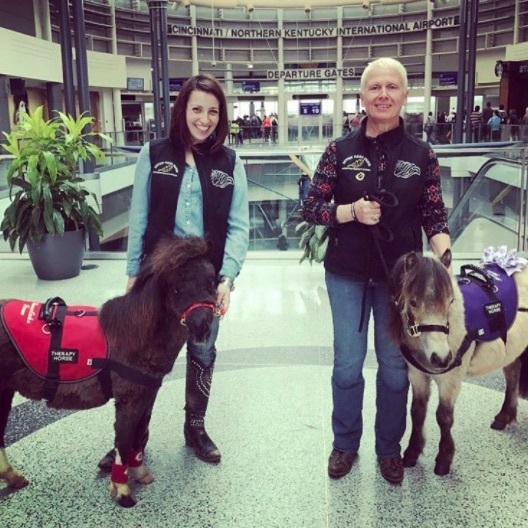 We repeat: THERE ARE MINIATURE THERAPY HORSES AT THE CINCINNATI AIRPORT. Let’s face it, flying is not always fun (okay fine, it’s downright awful sometimes) and recent news stories have us believing it’s only getting worse. But when miniature therapy horses are provided, watch how fast we can change our “flying is a bummer” tune. The Cincinnati Airport has come up with the best solution we’ve seen for calming nervous and angry passengers. NPR reports that the airport has partnered with the non-profit Seven Oaks Farm to bring 34 therapy horses to the ticketing area twice a month. Airport official Wendi Orlando says she loves it when the horses show up. More than 30 airports across the country now have therapy dogs. San Francisco has a therapy pig. And San Jose has a therapy cat. We honestly couldn’t love this more. Going forward, we’ll now book all travel plans not for the most convenient airport or for the most direct flight but by which airport has therapy animals.